A Birthday Party with a Chocolate Twist! Our birthday parties are a brilliant blend of the informative and the fun, the messy and the creative. Children taste, design, decorate and mould to create and take home wonderful, unique chocolates certain to impress! Build a party to suit your child's age, interests and your budget. We can help you can throw a party everyone is delighted with! ​We have a range of options but each can also be tailored specially to suit your child and their friends. 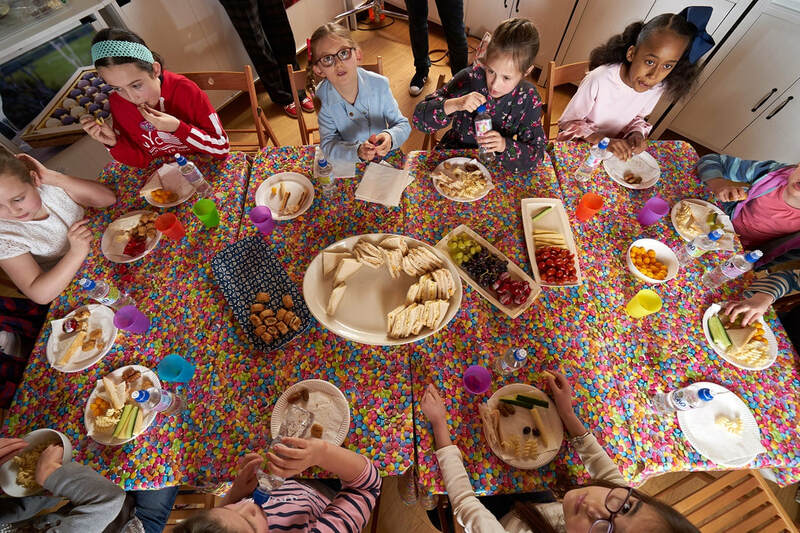 All of our parties include the main chocolate making activity / activities, a chocolate tasting flavour game and other chocolate-themed activities, personalised specially for your child. Read more about each party by following the links above or jump to summary and booking. We also offer several add-ons to complete your party including party bags, party food at our on-site Cowshed eaterie, home-baked bespoke birthday cake made to order and/or a photographer to remember the special occasion by. Read more here. We look forward to welcoming you to our workshop to celebrate with your child in chocolate style! We will first set their creative juices flowing by getting the mini chocolatiers to design their dream chocolate pizza on paper. 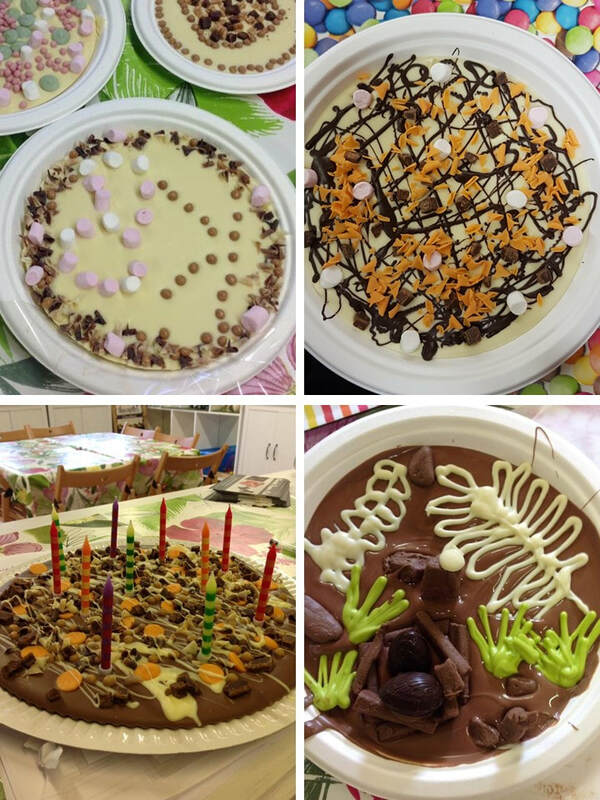 These pizza masterpieces are then turned into reality as each child first gets to pour molten chocolate and create a pizza base; they can decorate this with tasty toppings such as marshmallows, buttons, chocolate curls, fudge, brownie pieces and other delicious treats. Find out more about the extras you can add to this party to make it even more memorable here (party food, soft drinks, a bespoke birthday cake, delux party bags and/or a photographer) or jump to our pricing and booking section. A ninety minute chocolate-making party creating hidden secrets in chocolate frogs! This party is suitable for children from ages 5 upwards. Older children enjoy the activities included in this workshop on a different level to youngsters and we tailor each party according to its participants. We have found this party package provides great results for children of all ages (and a few grown up children too!). Guests firstly use specialist cocoa butter-based edible paints to decorate the outside of their frogs which are given to them in two halves. Once decorated, the children then pour chocolate into their hollow frogs and fill them up with 'hidden secrets' (a delicious variety of chocolatey inclusions). Finally, the two halves of the frog are sealed together using chocolate. Each child can then take their very own unique hand made chocolate frog home to show their family or friends (if it gets that far!). This workshop is our absolute favourite and our most popular package for children's parties. 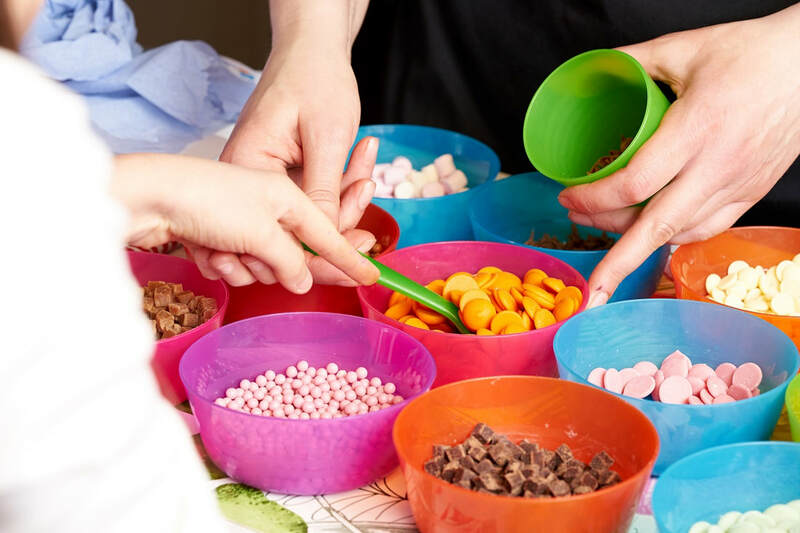 Suitable for all ages from about 7 years upwards, this fun chocolate making activity is versatile and can easily be personalised to make it an interesting, sticky and engaging activity for all your guests. The little ones love playing with our edible cocoa butter paints to decorate their bars with their own 'designs', while older children can't believe their eyes when they pour the molten chocolate in to moulds and are actively encouraged to scrape their own bowls out! Children of all ages love taking home their chocolatey creations and this party option allows each guest to make four of their very own, absolutely unique, certified delicious chocolate bars. The standard bespoke bars party lasts around ninety minutes and can be coupled with making hand piped lollipops for a different set of skills and a longer experience lasting around two hours. Surely eggs aren't just for Easter? Create your own dinosaur eggs, owl eggs or even chocolate birthday heart or flower eggs - you decide. Guests firstly get to decorate their egg shells with our specialist cocoa butter-based edible paints to create a bespoke design. Once the outside of their masterpieces are complete, participants drizzle the eggs with liquid chocolate and fill with hand-made hidden secrets of chocolatey deliciousness! Finally the two halves of the eggs are put together, ready to hatch at home. This party is suitable for children from ages 5 upwards. Older children enjoy the activities in the party on a different level and we have found that its sticky, fun provides great results for all ages (including a few grown up children!). This party is approximately 90 minutes long but can be coupled with hand piped lollipops or mini slab bar making for the 'ultimate' chocolate making experience. (An additional 30 minutes of chocolate-fun which uses a different set of skills. We only recommend this party 'add on' for children of 8 years and over.). Guests are first taught how to make a milk chocolate-based ganache from chocolate and cream, giving them enough information to have a go when they get home. This truffle mix is then hand piped into chocolate shells, sealed with chocolate and hand rolled for a deliciously decadent and rustic finish. Why not pair this with hand piped lollipops to build a workshop lasting two hours or even with slab bar making for the ultimate two and a half hour chocolate-lovers treat? This final option is full on for serious chocoholics only! **New** The Chocolate Shed is able to offer individual party food boxes each containing delicious sandwiches handmade in the Cowshed cafe, a packet of 'Two Farmers' crisps in fully compostible bags, raisins, a Henley Chocolates chocolate bar and jugs of squash at a cost of £5.50 per child. The party food boxes themselves are sourced sustainably and can be reused or 'upcylced' at home! Hot food options, such as bowls of chips, can be added to the feast on request! Guests will stay in The Chocolate Shed to enjoy their meal. Chocolate making is thirsty work! A choice of soft drinks (orange/blackcurrant squash or water) can be provided at a cost of 50p per person. You are welcome alternatively to bring your own drinks. ​At all of our parties guests are given a Chocolate Shed bag in which to carry home their creations to which you are welcome to add. We also work with a local photographer who has a competitively priced party photography option. If you would like more information, date availability or to make a booking please click the 'Book or Request Info' button below. 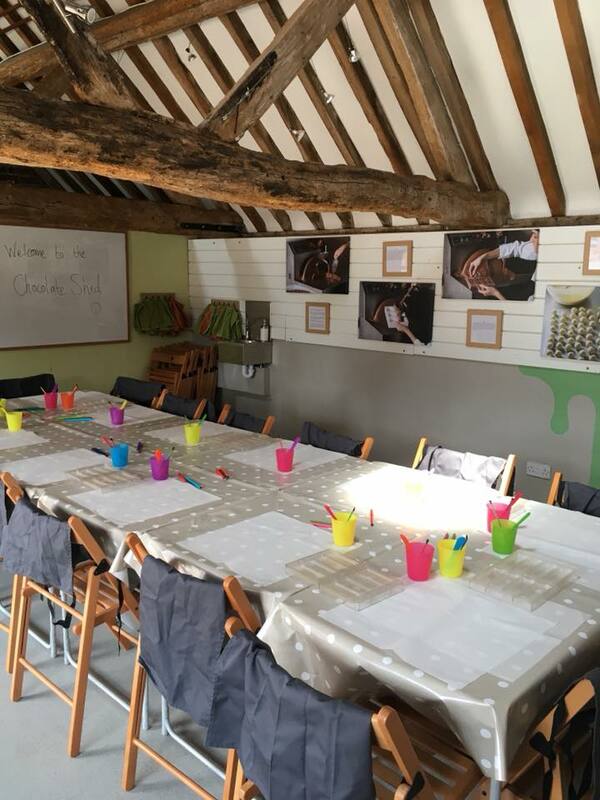 We look forward to welcoming you into our workshop and making your child's birthday party that bit more chocolate-y special! * Note this party requires one adult (parent or guardian) per 2 children ie. 5 adults for a group of 10 mini-chocolatiers, up to 8 adults for a group of 16 children. ** All Prices are based on the party being hosted on site ('The Chocolate Shed', Wootton Waven). We are happy to host parties in suitable venues off site (within a 25 mile radius) for a small additional cost. Please ask for a quote using the booking form. *** We are happy to cater for more guests than the maximum suggested above if you have access to an alternative suitable venue for the party. Please ask for a quote via the booking form. We usually use milk chocolate in all our parties but can prepare dark (no dairy ingredients and vegan friendly) or white chocolate options if preferred - please let us know when booking if this is required. After booking is confirmed we will ask all participants (or the parents/guardians of those under 18) to let us know of any allergies or medical conditions that we need to be aware of.